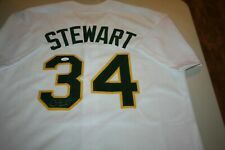 UP FOR SALE IS BEAUTIFUL CUSTOM OAKLAND A'S JERSEY SIGNED BY WS CHAMPION DAVE STEWART. DAVE SIGNED IN SILVER (SEE PIC). JERSEY IS SIZE LARGE. GREAT FOR DISPLAY OR TO WEAR! It includes a tamper proof sticker with serial numbers. Certification can be verified and viewed through the third party's online database. This item was personally hand signed by Rickey Henderson in black sharpie. This is a custom jersey and was not manufactured by or in any manner associated with any professional sports league or manufacturer. This custom jersey carries no professional sports league designation. Item for sale is a Josh Donaldson signed Majestic replica Oakland Athletics alternate jersey. Jersey is made in the USA (not a Chinese knockoff). Actual card pictured unless otherwise noted. Can’t find what you’re looking for?. We are always looking to buy single or entire Mcfarlane collections! We have the largest selection of Milwaukee Brewers SGA Bobbleheads on the planet! Number 33 added on the front, professionally done and accurate to the jersey style. Back is blank, no sense in customizing it since the autograph is on the front. OAKLAND ATHLETICS JOSE CANSECO SIGNED WHITE JERSEY "JUICED" JSA COA!!! Custom jersey" jersey is size XL. You may not receive exact jersey in photo as we have multiplies but it will be one identical. So give us a Try! This is a "Career Stat" Authentic Signed White Majestic Jersey that has been Personally Signed & Autographed by Jose Canseco of the Oakland Athletics. This item is 100% Authentic to include a Certificate of Authenticity (COA) / hologram by Beckett Authentication Services Witnessed #I87999. Custom on-field style jersey. Everything is sewn on, size XL. Hand-signed in silver paint pen by Sal Bando. The signing of this item was witnessed by JSA. Awesome autographed jersey. Comes with hologram on jersey and certificate to back up from Dave and Adams. Ruben Sierra “El Caballo” signature on jersey. Awesome addition to any collection! Feel free to make an offer!!! Shipping will be $8.99. The signing of this item was witnessed by JSA. Authentication: JSA COA. 1989 OAKLAND ATHLETICS AUTOGRAPHED BAT & JERSEY (WORLD SERIES CHAMPS) LOT! You Will Receive The Following JIM CORSI AUTOGRAPHED BAT. The Bat Was Used And Cracked During Spring Trainin g At The A's Minor League Complex. SAL BANDO AUTOGRAPHED CUSTOM JERSEY (OAKLAND ATHLETICS) - JSA COA! Custom on-field style jersey. Everything is sewn on, size XL. Hand-signed and inscribed in black felt-tip pen by Jim Holt. Don't miss your chance to own this beautiful jersey of STUD YOENIS CESPEDES when he was on the A's! The signature on the jersey is authenticated by DELUXE SIGNATURE COLLECTION and has been marked with a tamper evident serial number. This is a Stitched Majestic Jersey. You can view this item on the JSA website. Up for sale is a gorgeous Green OAKLAND ATHLETICS jersey signed by # 16 JOSH REDDICK himself. Don't miss your chance to own this beautiful jersey of STUD JOSH REDDICK of the A's! The signature on the jersey is authenticated by Janes Spence Authentications and has been marked with a tamper evident serial number. ROLLIE FINGERS Hand Autographed Signed on line under Athletics Letters OAKLAND ATHLETICS BaseBall XL JERSEY MLB with COA. SAL BANDO AUTOGRAPHED OAKLAND ATHLETICS CUSTOM JERSEY. HE HAS SIGNED A CLEAN SIGNATURE. THE JERSEY HAS HAND STITCHED NUMBERS AND LETTERS. JERSEY SIZE: XL. VERY RARE ITEM. 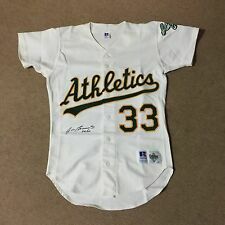 JIM HOLT AUTOGRAPHED CUSTOM JERSEY (OAKLAND ATHLETICS) - JSA COA! MARK MCGWIRE SIGNED OAKLAND A'S JERSEY NUMBER 5 THAT CAN GO ON EITHER THE A'S HOME OR AWAY JERSEYS OF HIS ERA. SIGNED BEAUTIFULLY IN SILVER PAINT PEN AND COMES WITH FULL JSA LETTER. JUST HAVE YOUR A'S JERSEY CUSTOMIZED AND ADD THIS FOR A PRICELESS COLLECTIBLE. NICE SIGNED MCGWIRE JERSEYS, NOT CUSTOMS OR KNOCK OFFS, SELL FOR AROUND $400. GREAT ITEM FOR THE 500 HR HITTING FIRST BASEMAN. NOTE IS FOR A SIGNED NUMBER THAT GOES ON A JERSEY AND NOT AN ACTUAL JERSEY. Custom on-field style jersey. Everything is sewn on, size XL. Hand-signed in silver paint pen by Jason Giambi (Yankees). The signing of this item was witnessed by JSA. Custom on-field style jersey. Everything is sewn on, size XL. Hand-signed in black felt tip pen by Bert Campaneris (A's). Don't miss your chance to own this beautiful jersey of STUD YOENIS CESPEDES when he was on the A's! YOENIS CESPEDES AUTOGRAPHED JERSEY (OAKLAND ATHLETICS) W/ PROOF! - Size 6XL! YOENIS CESPEDES AUTOGRAPHED JERSEY (ATHLETICS) W/ PROOF! The Back Of The Jersey Is Blank. The Jersey Is A Size 6XL! Hand-signed in silver paint pen by Sonny Gray. Majestic on-field style jersey with everything sewn on, size 48. JOSE CANSECO - OAKLAND ATHLETICS "5x Stat" AUTO SIGNED JERSEY BECKETT AUTHENTICATION SERVICES (BAS) WITNESSED / CERTIFIED LOA. This is a "5x Stat" Authentic Signed Green Jersey that has been Personally Signed & Autographed by Jose Canseco of the Oakland Athletics. "89 WS MVP". "'A's HOF 2018". "89 All Star". Custom on-field style jersey. Everything is sewn on, size XL. # J 51576 . All Numbers and Letters are Sewn On and Jersey Size is XL . 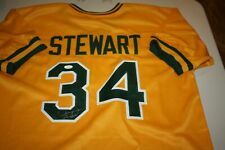 UP FOR SALE IS BEAUTIFUL CUSTOM OAKLAND A'S JERSEY SIGNED BY WS CHAMPION DAVE STEWART. DAVE SIGNED IN BLACK (SEE PIC). JERSEY IS SIZE LARGE. GREAT FOR DISPLAY OR TO WEAR! Rollie Fingers Signed Athletic's Majestic Authentic Jersey (PSA) 1992 H.O.F. Majestic Authentic on-field style flex base jersey, size 44. Jersey has been hand-signed in black felt-tip pen by Rollie Fingers (HOF).